Whether you’re bathing your baby in the sink or splashing around with your toddler in the bathtub, water is great fun for kids. But it’s also a place where safety must come first. Drowning is the leading cause of injury-related death among children between 1 and 4 years old. And it’s the third leading cause of death among children. Nationally, drowning ranks second only to automobile crashes in injuries and deaths, claiming the lives of approximately 4,000 children each year and leaving another 12,000 with some form of permanent brain damage. Put the cell phone away, forget about all the other things you have to do and give young children 100 percent of your attention when they are near or around water. 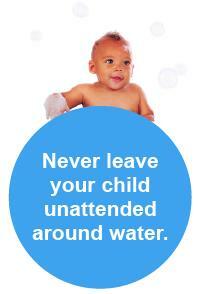 Keep toilet lids closed and use toilet seat locks to prevent drowning. It’s also a good idea to keep doors to bathrooms and laundry rooms closed. Parents have a million things to do, but learning CPR should be on the top of the list. It will give you tremendous peace of mind and the more peace of mind you have as a parent, the better.